I’m not sure I could have put it better myself. Leaving aside the fact that Parliament could perfectly well introduce a Finance Act with a tax rise, and that would crack the ‘lock’ by impliedly repealing the legislation introducing it, what does the ‘lock’ actually mean? I’ve seen a few loopholes in my time so let me tell you. Subject benefits to income tax. Lower the threshold at which NICs were paid, a measure that would hit the poorest hardest. 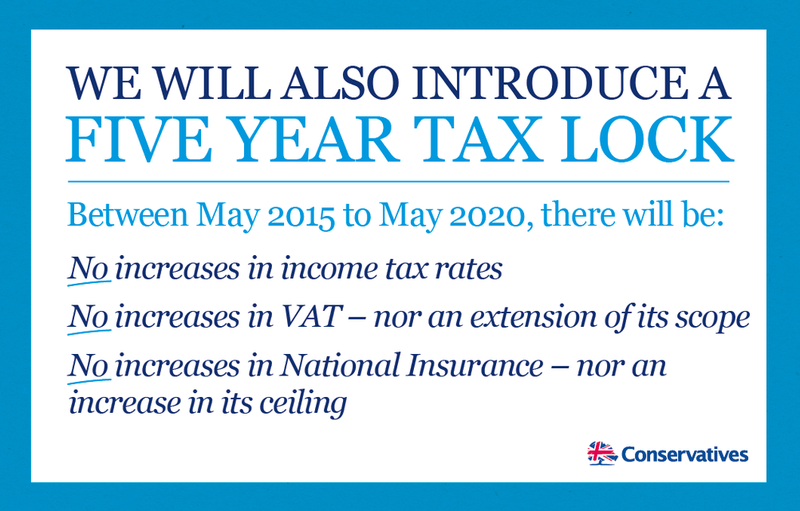 Note that the Conservatives pledge only that they won’t increase the ceiling not that they won’t reduce the floor. Jettison reliefs from income tax – for example on childcare, or pension contributions – or national insurance contributions. The loss of these reliefs can have a profound impact on your tax bill. Amend the thresholds at which different tax rates were paid. Such an amendment could increase or decrease the tax bill of any individual. There is no pledge in relation to inheritance tax, capital gains tax, corporation tax, stamp duty, air passenger duty, and so on. Increases in all of these taxes remain entirely possible – if not likely. The Conservatives could reduce the VAT registration threshold, compelling hundreds of thousands of small businesses to charge VAT on their sales. I could go on, and on. But what’s the point: even if you assume the ‘lock’ is adhered to, it’s all but meaningless. Note: I have amended to add the first bullet point. I’m a little lost here Jolyon. You have previously argued AGAINST raising IT personal allowances because it wouldn’t be the poor who benefited. Now you appear to be arguing that the NIC threshold (which, let’s note, nobody has said they will do) because thay will hit the poor hardest. Could you explain a bit further. Would you support a reduction in personal allowances for instance? Or they could introduce a ‘new’ tax with a different name (but an income-referencing base) – maybe a means-tested ‘NHS solidarity surcharge’. If a government is willing to dodge double tax treaty obligations by that means (see the ‘diverted profits tax’), then what’s a manifesto commitment? Pingback: Waiting for Godot | What’s the legal content of the Tax Lock? I sense the hurt in that post Paul. I’ve always thought Benjamin Franklin just didn’t have a good tax adviser…..
Of your list of ideas as to what the Tories might do to get round their (rather meaningless pledge), which would you support?